As a kid growing up in Vermont, Rob Irion would snuggle into his father's recliner and pore through the pages of National Geographic magazine. He'd marvel at stories of exploration and scientific achievement, and dream that, one day, he'd see his own name on the cover of the venerable magazine. Forty years later, Irion's dream came true. 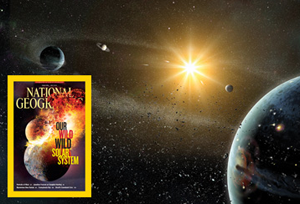 The director of UC Santa Cruz's Science Communication Program saw his 18-page article on the violent origins of our solar system grace the cover of this month's National Geographic. It's an achievement Irion — who has penned stories for Discover, Smithsonian, New Scientist, and Sky & Telescope magazines, among others — calls the pinnacle of his career and a story that was a decade in the making. Irion began his life's work with a bachelor's degree in Earth and planetary sciences at MIT and plans to get a Ph.D. in astrophysics. But his love of writing soon drew him toward journalism and a reporting job at two small Boston-area newspapers: the North Reading Transcript and the Lynnfield Villager. There, Irion honed his skills on stories of town meetings, high school basketball games — and one play review that drew the ire of a local mom who bristled when Irion noted her daughter seemed a little too aware of her surroundings in her role as the blind Helen Keller. Moving to California in 1987, Irion studied under John Wilkes in UCSC's Science Communication Program. 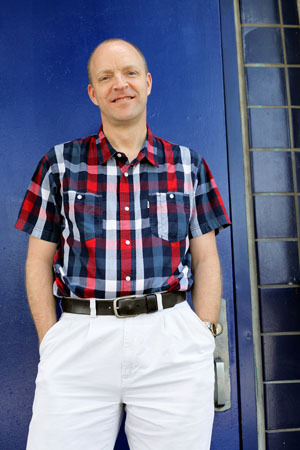 After nine years as the science writer for UCSC's campus news office, he soon began filling his portfolio with magazine articles — stories of galaxies, asteroids, and the universe. But a trip to Barrow, Alaska, where Irion strapped on a bear rifle and rode toboggans over the rough ice for a Discover magazine story about scientists exploring the possibility of life on Jupiter's icy moon Europa, focused his attention on our solar system. Smithsonian articles on planets and hazardous near-Earth objects followed. "It began to gel in my mind that our concept of the solar system as a familiar, unchanging place was not correct," says the 49-year-old. "Early in its history, it actually was a very changeable, violent, and unstable place." Pitching that story of our solar system's wild birth and adolescence to editors at National Geographic, Irion was given the go-ahead for a story that would lead him to a close encounter with the very beginnings of life — a 4.55 billion-year-old dust particle snagged from a comet by the NASA spacecraft Stardust. Examining that speck through a University of Washington electron microscope gave Irion chills. "It's rare you get to stare at your own origins," he says. The finished article — which was crafted with the help of UCSC Astronomy Department Chair Greg Laughlin and National Geographic senior editor Rob Kunzig, and includes stunning illustrations by space artist Dana Berry — took two-and-a-half years from pitch to publication. But, notes Irion, it was actually a decade of research and writing that led him to it — a fact he impresses on his UCSC students. Science writing is not always quick or easy. It is a lesson Sci-Comm's 300 graduates have taken to heart as they move through a rigorous series of newspaper, online news and university internships that are at the heart of the program. With alumni like National Geographic's Jane Lee and the entire science-writing staff of Wired.com in San Francisco, the program has nearly a 100 percent success rate of students working in the business, according to Irion. So why spend years researching and writing about science? "Because it fosters a sense of wonder in people," says Irion. "And that's worth something." Irion will read from the article and discuss the violent origins of our solar system at 7:30 p.m. July 10 at Bookshop Santa Cruz, 1520 Pacific Ave., Santa Cruz. The event is free.